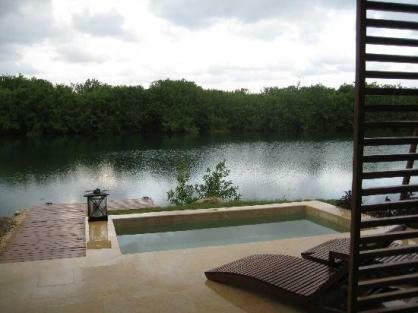 Rosewood Mayakoba is located 30 min. south of Cancun in the Riviera Maya. 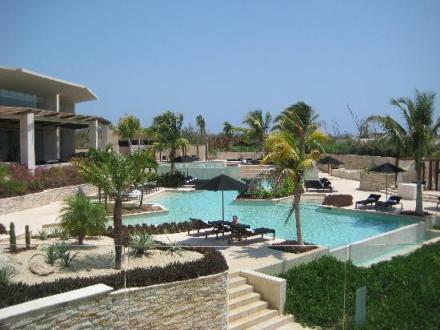 It is on 1600 acres of a luxury enclave with a private mile long arc of white sand. This luxury beachfront,boutique hotel was built by peaceful lagoons and made with indigenous materials. This hotel is definitly luxury! You will pay for the luxury but it is definitly high class and you can tell! 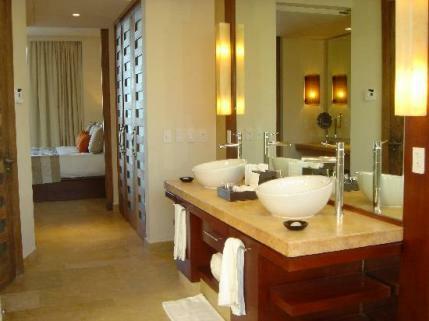 You will be treated like royalty at this Riviera Maya hotel. Upon arrival at this boutique hotel you will be transported by luxury boat to your room in one of the 128 suites offered. Some rooms are oceanfront, some are lagoon suites. This is the unique part of this hotel! There are lagoons that run thru the resort so you will most likely take a boat everyday to the main part of the resort. The rooms at this beach hotel are unbelievable! Let me tell you about them! First, here are a few pics of the rooms. spacious bathrooms. Some have outdoor showers and plunge pools. 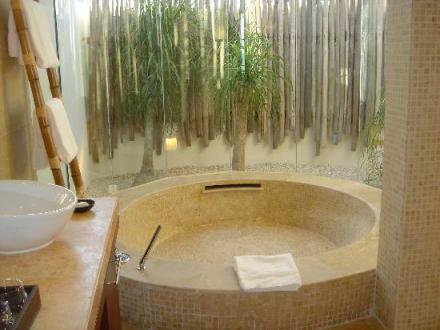 This picture shows the huge bathtub in your room! If your located on the lagoon you will have a boat dock to catch your boat taxi to the other part of the resort each day. Lagoon Suite: located on the lagoon with plunge pool, rooftop sundeck, outdoor shower, views of lagoons and mangroves. Deluxe Lagoon Suite: the same as Lagoon Suite but is has 1 bedroom that is seperate from rest of suite. Here is a picture from a Lagoon suite. Deluxe Overwater Lagoon Suite: All same amenities as above, but is appears to float. Has floor to ceiling sliding glass doors. Beachside Lagoonview suite: Steps from the ocean with separate livingroom and a side terrace by lagoon and plunge pool. 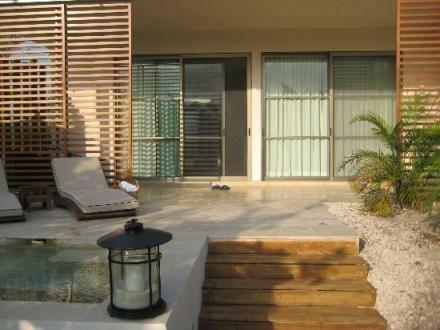 This picture shows a suite right on the beach with a plunge pool. Ready for you to jump right in! Oceanview Suite: Oversized one bedroom, large foyer, separate livingroom, rooftop patio, plunge pool. Island Suite: Private island with plunge pool, outdoor shower, for adults only. These accomodations are luxury! You can't find this at many other resorts! This beach hotel is unique to suites on the lagoon! Concierge, Butler and Room Service are available 24 hours a day. What restaurants are at Rosewood Mayakoba? This Riviera Maya luxury resort has a few different options for meals. None of the meals are included in your rate. If your accomodations are on the lagoon, only breakfast is available in that area. For all other meals you would need to take the boat to the main area. Basically, this is a high quality intimate hotel that I cannot say enough about! It should speak for itself! 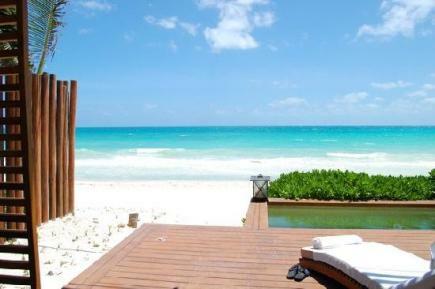 You will get what you pay for at this luxury Riviera Maya boutique hotel.